In an effort to partially apologize while at the same time thoroughly explain my tardiness in writing, let me try to make an incredibly long story short, although that is generally an impossibility for me. During our entire time here in the Blue Ridge Mountains we have experienced very bad internet connection problems that border on the old Chinese torture method of death by a thousand cuts. So much so that in the last two months we have had the cable techs out here twice a week (on average) with no solution. Every piece of equipment has been replaced at least twice. Finally, during my last fit of exasperation my Zen sang froid boiled over and the old me returned as a kind of fume – one that made its presence felt at the local broadband HQ. This, despite what you may think, was a very positive expression, not negative as it may appear in isolation. I figured that every rational, reasonable solution had already been tried by the caravan of techs that had already been to our abode, and our salvation may indeed rely on more magical processes, processes this man may know better than most. Josh was a commanding presence as he walked to the study where the modem, router and ingress lines feeding the house were installed. Josh said he had looked over all the tech reports and it was very strange. Our entire neighborhood showed on average one (1) data drop (his words) per month for the entire year with one exception. We were, of course, the exception. Our “data drops” were happening at an average rate of 677 per month and so far this month we had reached 315. If the average drop outs had been 11 less (666) I would have known there was a diabolical reason for it. After showing us the data Josh took out his little meter and small tool set and began fiddling with every little wire and nut he could find. After finding absolutely nothing he looked up and said, “Electricity is a weird fairy like thing.” I gasped at the profundity of the thought. I was still panting in anticipation of something or other, but then he walked outside. Dumbstruck I looked at my wife and was relieved to find that she was just as dumbstruck as I (a long marriage usually fosters this Mutual dumbstruction response) and we both just started laughing as we resigned ourselves to the fact that since most of our happiest days were in the 20th century, it wouldn’t be so bad going back in time and living there. A half hour later, just as we were approaching the Disco era, in walks Josh with a small connector and a small piece of wire in his hand. “I think I’ve found the fairy weirdness,” Josh said as he brought us the evidence. He showed me the very thin wire and said it was contaminated by what he thought were paint or insect droppings. I could barely see the wire so I took his word there was something contaminating it. Whatever it was he seemed thrilled to have found it, and he brightened up considerably. He replaced this and that and I could swear I heard him whistling while he worked. The story is getting long like I feared so I’ll cut to the chase. At least we have been spared the plague. My god, that’s the first I’ve heard of that but as I’ve said, my “connection” to the world has been sporadic at best. So the Bubonic Plague is alive and well in the American Southwest. The CDC or somebody like it says it would make a lousy bioterrorism weapon since it is so easily treated with penicillin. Flagstaff had it, and Yosemite National Park had to close down a section where the dead animals with guilty fleas were located. I will limit my hiking to the Appalachian Trail. Speaking of life in the woods, and the Wabi Sabi existence that appeals to you of late, I have often felt that the main stumbling block that Buddhists have to overcome in this country (and others in the West) is that lack of community that can act as a foundation of sorts when the spirit juices aren’t flowing as freely as we would like them to. It’s hard for a Zen Buddhist to walk down the streets of his city or town in the grip of doubt or despair and not find himself propitiously standing by the entrance of a cathedral. Christianity is laid on thick, while the Zen community is spread so thin that is almost a veneer. 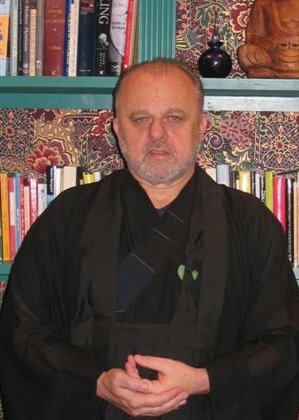 It is doubly hard for us Western Buddhists since most of us came to Zen with some kind of suspicion about the ways we had been taught and indoctrinated in our youth. There is an almost innate wariness about the symbols and structures of the past that we rejected or redefined. Groups or loose confederations of Zen hermits or any kind of retreat from society requires us to build anew. The question is how do we build anew, I suppose. Trust is the biggest issue. Yet there was a gnawing sense that there must have been some reason to erect a communal palace on the pillars of the Buddha, the Dharma and Sangha. For a long time I believed two out of three ain’t bad. I could maintain some balance as long as I didn’t try to save the world. In the end the only thing missing from our “usual” practice is the celebrations. And deep spiritual enlightenment is, if nothing else, highly celebratory. But celebration does imply celebrants doesn’t it? Yet even today, if we were to celebrate the Zen High Mass, I’d find it harder to imagine myself on the Lion’s throne than being the man in the corner smiling in a knowing sort of way (ha ha). In that sense I miss the Sangha and wish there was a way we could foster it. It is a laudable goal I agree. The Sangha is where the stories are told, I suppose. Obviously the case with Buddha, inarguably the case with Jesus where Paul had the most successful blog of all time going on. I don’t know enough about Islam to say what happened with Mohammed and his boys but I rather suspect it to be the same. I competed in a member tournament this weekend in which my partner and I won low net. During the two day event one of our competitors started talking about this Buddha guy (my reputation has a way of leaking out). One of our foursome was a retired army guy. He spoke up and said he put a statue of Buddha in his garden but his wife demanded that he get rid of it. I asked him why and he said because she told that the Buddha was this fat lazy guy who just rubbed his tummy and told everybody not to worry about anything. He asked me if that was true or not. I just laughed and said I suppose one could look at it that way but I thought it was a bit more nuanced. I guess the moral of that story is…I wouldn’t even know where to start. I don’t even know what a blog is for example.